Research increasingly supports a newer approach to mood disorders which is more effective than antidepressants. Find out more from the people who pioneered it. 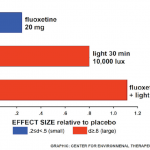 Editorial: Why Do People Take Pills for Depression If Light Therapy Can Be Better? Depressed, Then Sleepless? Or Vice Versa?